Our Earth is made mostly of rocks. The rocks are composed of mineral grains combined in different ways and having various properties. Minerals are naturally occurring chemical compounds in which atoms are arranged in three-dimensional patterns. The kind of elements and their arrangements lead to a particular appearance and certain properties for each mineral. The same chemical elements when arranged in different patterns show different characteristics. Classic examples are minerals made of the element carbon (C). Flat planes of carbon atoms form the mineral graphite, which is a gray, slippery, soft material. Carbon atoms arranged in a different pattern form the mineral diamond -- the hardest natural substance known. Although they have the same chemical composition, their different internal crystal structures form very different materials. About 100 different minerals are known to occur in Indiana and doubtless many other exist here in small and as yet unnoticed amounts. 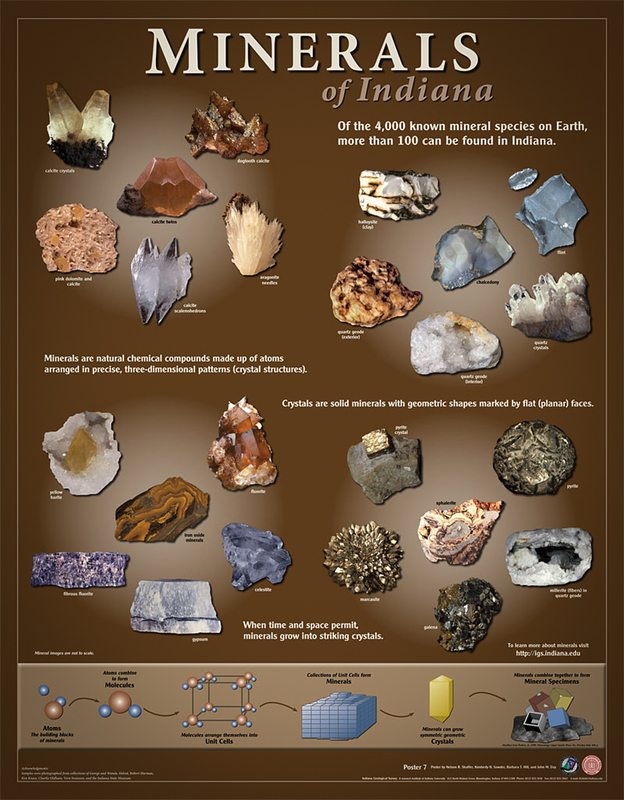 Indiana is best known for fine examples of the minerals calcite, dolomite, quartz, pyrite, fluorite, and celestite. Scientists can distinguish more than 4,000 different minerals but many are very rare. About 200 minerals make up the bulk of most rocks. 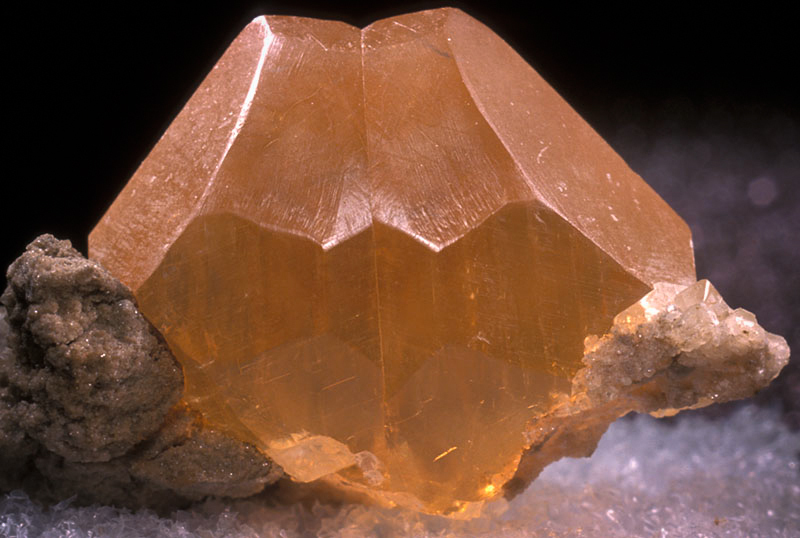 The feldspar mineral family is the most abundant. Quartz, calcite, and clay minerals are also common. Some minerals are more common in igneous rock (formed under extreme heat and pressure), such as olivine, feldspars, pyroxenes, and micas. Metamorphic rocks are those that have been transformed by pressure and heat but that have not actually melted. They contain many minerals in the mica family and high-pressure types such as garnet. Igneous and metamorphic rocks are not present in Indiana's bedrock unless buried very deeply. Sedimentary rocks, the third general rock type, are the "bones" of Indiana. Sedimentary rocks are made from sediments, which are small fragments of rocks torn from preexisting hard rocks and transported into seas ancient and modern. Sedimentary rocks also grow where minerals form from water through chemical precipitation. Sedimentary rocks may also be composed of the skeletons of preexisting organisms (fossils). Such rocks are common in Indiana and make major mineable economic deposits. Limestone, gypsum, and dolomite are sedimentary rocks that are important to Indiana's economy. Sandstone, shale, and clays also occur here. Igneous and metamorphic rocks are found in uncemented deposits as weathered pieces. These were brought here from the north by huge continental ice sheets during the Ice Age and left fragments over the surface of nearly three-fifths of the state. The rock cycle, which operates through vast geologic time to form and reform the rocks of the Earth, shows the relationship of different rock types.